Food has changed quite a bit in the last 100 years, as most people realize. The fast-paced world of today is filled with fast food, meals on the go, and not as many sit down dinners as were common 50 years ago. People just don’t have the time. Many foods and dishes have come and gone in popularity, and some remain solid staples in American cuisine today. Things like spaghetti, mac and cheese, and casseroles can still be found in households across the United States, even if they aren’t being served at a traditional sit-down dinner. What dish do you remember most from childhood? Let’s take a look at food trends and popular meals through the decades, and how it all compares with our idea of food today. Two holiday desserts. Photo circa 1905. The early 1900s was a time long before modern kitchen technology. Meals were prepared from scratch and from things grown or raised on family farms or in gardens. Whatever was readily available was utilized. Because family farms were abundant, many families were able to grow and raise a wide variety of animals and plants. Meat was a staple in all households, whether it be beef, chicken, or ham. Seafood was popular, as well, and if it was accessible you can bet it was used! Sweets were almost as abundant as meat in people’s diets circa the early 1900s. Dinner was usually finished off with cake or pie, and of course coffee. The ‘roaring 20’s’ was a great time for food. The in-home refrigerator (invented in 1913) was becoming more and more commonplace in homes, meaning foods that spoiled easily could now be utilized in day to day cooking. Meat was still a large part of family diets and was usually eaten at every meal. Breakfast, lunch, and dinner were not always made from scratch, however, like in the early 1900s. 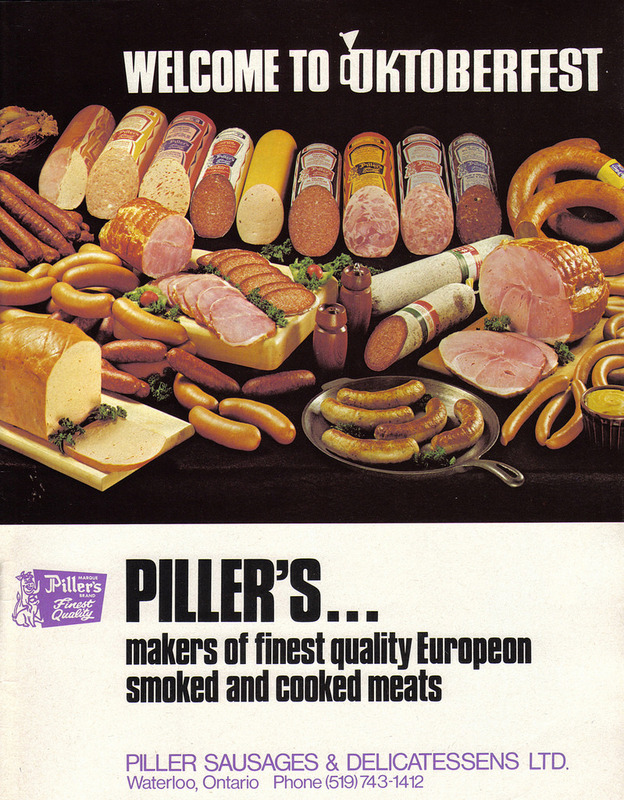 Canned foods were gaining popularity, and they were making cooking easier! Sugary treats were on the rise too with the invention of many different candies that we still consume today! Also remember, this decade is when prohibition came around. A society that was used to having a drink every now and then was forced to give it up (unless there was a speakeasy nearby). Believe it or not, cocktail party popularity peaked during prohibition. People started entertaining their guests with fruit cocktails instead of alcohol-filled cocktails in response to the lack of booze. Ingredients for the perfect Jell-O Salad. Circa the mid-1930s. Pre-made, canned, and packaged foods started becoming more common in household kitchens in the 1930s. While meat was still the main ingredient in many dishes, families turned to cheaper cuts due to price changes during the Great Depression. In many cases, the cut of meat didn’t matter because it was going to end up in a dish like goulash, soup, or a casserole. ‘One-pot’ dishes became go-to meals during the time of the Depression because they could feed an entire family with fewer ingredients and less cook time. For families who had fallen on hard times, soup kitchens and bread lines became the place to get a hot meal, although many people in need refused to stand in line because of shame. One dish that gained popularity in the 30s and stayed popular through the 70s was the Jell-O salad. A dish that mixed ingredients together much like a casserole, this ‘salad’ was just the kind of dish that a family trying to stretch their dollar would make. 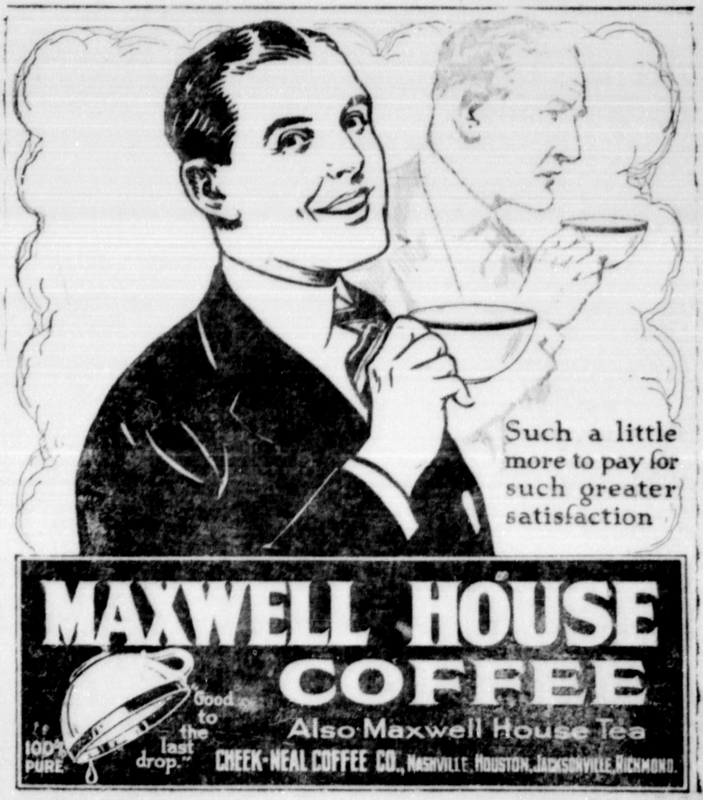 An ad from the mid-1940s. This was the decade of food rationing. World War II had people stretching their limited ingredients as far as they would go. Family recipes were re-worked to use what was available or what families had on hand already. The second world war took many men away from their families and thrust many women into the working world. This meant that meals had to not only be made with little ingredients but had to be pre-made or have a quick cook time. Yet again, casseroles, Jell-O salads, and one-pot meals that incorporated many different ingredients were the focus of many family dinners. 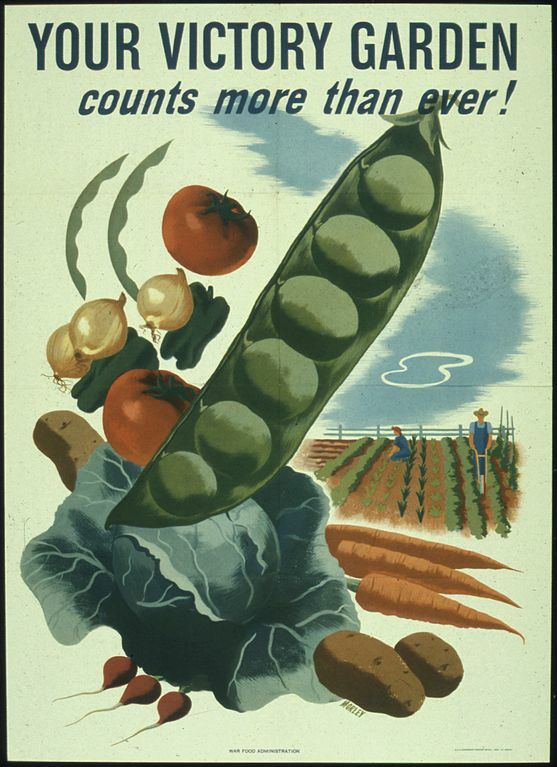 Because certain food items were being shipped to troops and not to the people at home, the government encouraged people to start growing their own produce in ‘victory gardens’ to provide their families with things they couldn’t get at the supermarket. When food rationing ended in 1946, sugar was the last thing to be ‘unrationed.’ After this, sweets became as popular as ever! The 1950s saw the beginning of the fast food empire when giants Burger King and McDonald’s sprung up in 1953 and 1955, respectively. As immigration stayed at a steady level, foods from across the globe became more mainstream in cities, giving people a taste of the world. People continued to create delicious home-cooked meals in the 50s, although pre-made and processed foods started creeping into the food scene little by little. Barbequeing became the best way to entertain guests and people took to their outdoor living spaces when the weather permitted to cook every part of their meal on the grill. Anything from steak, to kebabs, to lamb, to salmon was thrown on the grill and cooked up! Side dishes to these meals were very similar to what we still eat at BBQs today: baked beans, potato salad, and salad made with fresh greens and produce. Fun fact: The mid to late 1950s was when frozen ‘TV dinners’ started to become commonplace in households. You were wrong if you thought we were going to be done with Jell-O dishes in this decade. 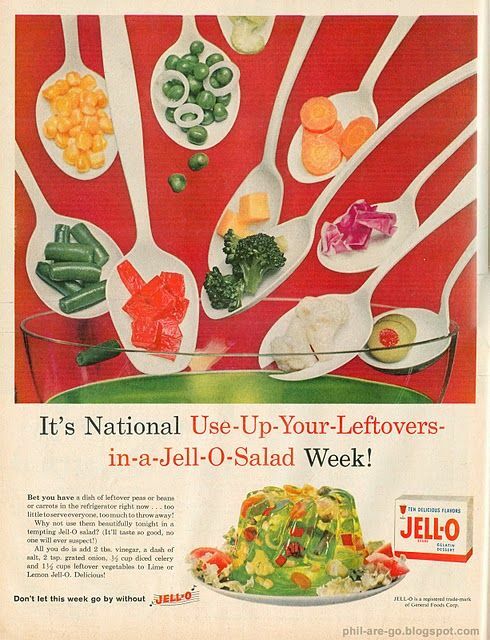 For some reason, Jell-O continued to dominate at cocktail parties, family dinners, and other neighborhood events. And no, we still are not talking about the sugary sweet Jell-O kids today know and love. At this point, Jell-O salads weren’t even being eaten out of necessity, but out of the pure aesthetics of it. Have you seen a Jell-O salad? They look pretty cool, but when you’re told that there is tuna in there, your appetite will definitely be squashed. The 60s was also a time when Julia Child was revolutionizing food by bringing the art of cooking French cuisine into family kitchens across the US. Child empowered mothers around America to put their skills to the test in the kitchen, bringing about a whole new era of food. Other than some very strange clothing trends, it was very fashionable to eat and cook with fresh fruits and veggies in the 1970s. 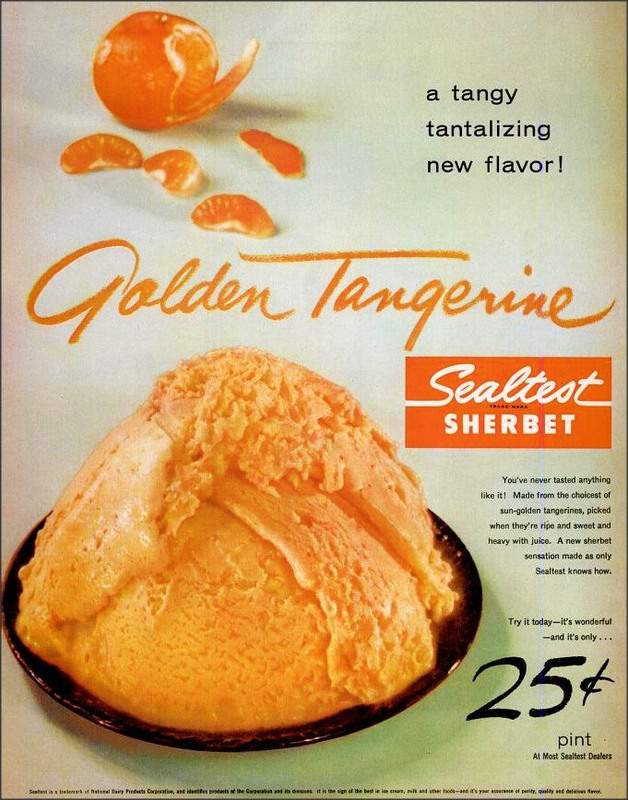 The word ‘salad’ continued to describe foods that were not at all salad, still including things encased in Jell-O, and now sweet dishes like the Watergate Salad. Pineapple was a hit at dinner parties and luncheons throughout the 70s. It was used in main dishes, side dishes, and desserts too! In fact, the Watergate Salad is made with pineapple. Sauce was used on lots of popular dishes during this time, although some recipes probably could have done without it. Cheese sauce, Hollandaise, and ketchup were all used very liberally on dishes. French cuisine continued to dominate, and it wasn’t a party unless there was quiche on the appetizer table. Say hello to processed food! 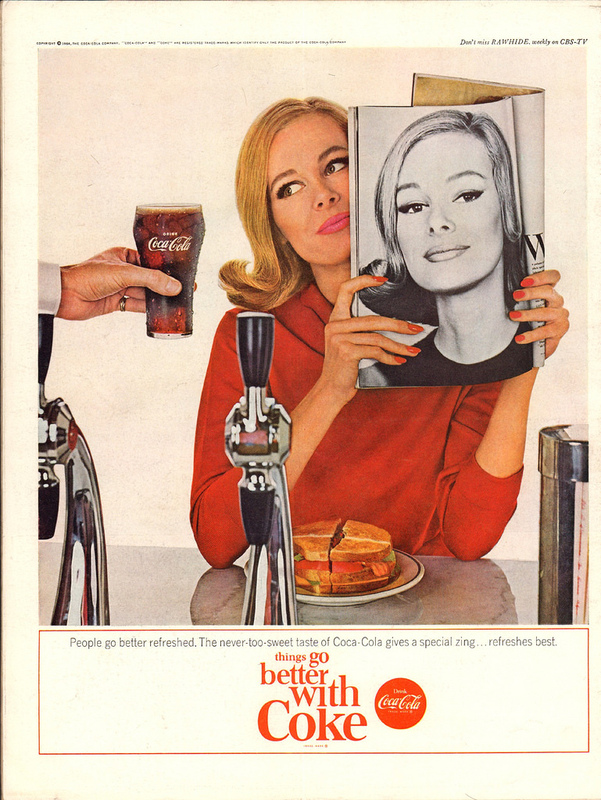 This was the decade when Cool Ranch Doritos became a thing, artificially flavored fruit snacks were all the rage, and Tab Cola was what the cool kids were drinking. Kids had to be home when the streetlights came on, and when they walked in the door mom had dinner on the table and ready to go. All day long the house smelled delicious because mom had been using her slow cooker to prepare that evening’s meal. If it wasn’t from the slow cooker, it was easy-to-make sloppy joes! Making food quicker to cook was uniquely 80s if you couldn’t tell. With Rice-A-Roni and pizza kits, who wouldn’t want to help cook dinner in the 1980s! Entertaining party guests was still a big deal in the 80s, and Seven-Layer-Dip was always a big hit at gatherings. It wasn’t unheard of for both parents to be working well into the evening by this decade, which meant foods needed to be more accessible to kids and babysitters. Lunchables were a staple in lunchboxes of most school kids and Pizza Bagels were the go-to after-school snack, for me at least! Adults were packing healthy salads as their lunches, with the top choice being a Caesar salad. Looking for a good 90s diet? All the ladies were trying Slimfast to drop that unwanted weight. Kids and young people, however, were munching away on their Dunkaroos. What foods were your favorites during childhood? What was the craziest thing you ever ate? What food did you hate the most? Let us know and then visit our recipe section at Fill Your Plate to find some recipes you’ll love! This entry was posted in Beef, Chicken, Cooking, Eggs, Food, Food Facts, Fun Food Facts, Vegetables and tagged cooking, decades, Family, food, History, throwback. Bookmark the permalink.